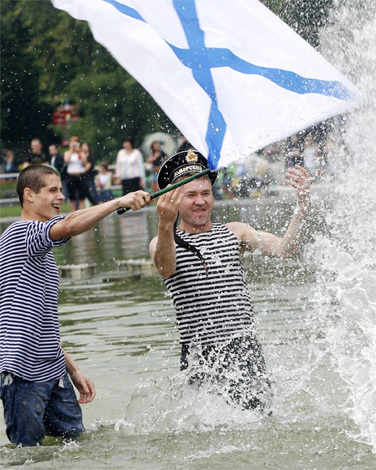 Wearing a sailor's cap and stripped vest, a man splashes standing in fountain while celebrating Navy Day in Gorky Park, Moscow, Sunday, July 29, 2007. The former seaman at left waving a Russian Navy flag. The celebration of Navy Day in Russia is traditionally marked on the last Sunday of July.